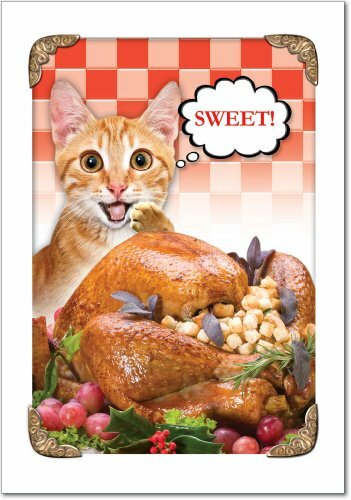 Say "Meowy Christmas" with these fun orange kitty cat Christmas cards. These 'Sweet Kitten' hilarious Christmas cards are the perfect stocking stuffer for someone close to you, whether they be an avid cat lover or can't resist those darn kitty cat eyes. We make our cards with high-quality paper that is meant to last. The holidays are about giving, so go ahead and give, give, give! Order 'Sweet Kitten' Christmas cards today! Known for our hilarious, funny cards and what has been described at times as snarky, sarcastic humor, most of our products are design based note cards and stationery products. NobleWorks' fun & humorous greeting cards have been making people laugh & blush since 1980 BC (before eCards were present). These high-quality, good as gold stationary cards are printed on-demand (and we are very demanding!) in the good old USA. Many of our fabulous custom & colorful cards are also available blank to appease one's closeted creative urges. You are free to make these blank and generic fold over cards more modern & unique to your work or office, write personal messages, or draw cute & fancy pictures...There are merely 7,000 hilarious stationary cards in the collection, from silly to slightly risqué to inappropriate dirty adult humor gifts, offering a plethora of everyday and seasonal assortments & card occasions. ...Are you thinking a lasting impression is important - ORDER NOW! Dare to laugh!